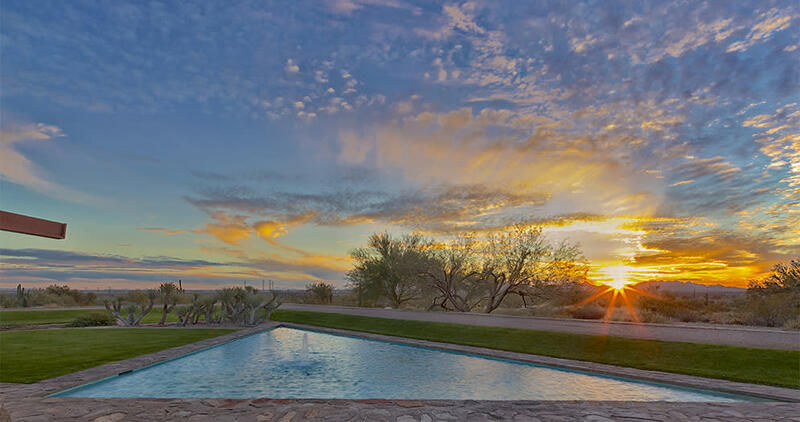 When you’re in a setting as visually stunning as the Sonoran Desert, every moment seems like a photo opp. This is especially true during sunset when our mountains glow mauve and purple, and towering saguaros cast long shadows over the desert floor. Grab your camera and head for one of these great sunset spots. Once the winter home of legendary architect Frank Lloyd Wright, Taliesin West is now a museum and working architectural school. Guided tours, which take you through Wright’s working and living spaces, are offered on a daily basis. Visit in the late afternoon or book the 2-hour Night Lights tour and watch as Wright’s buildings and the surrounding desert take on a luminous, jewel-like quality at sunset. 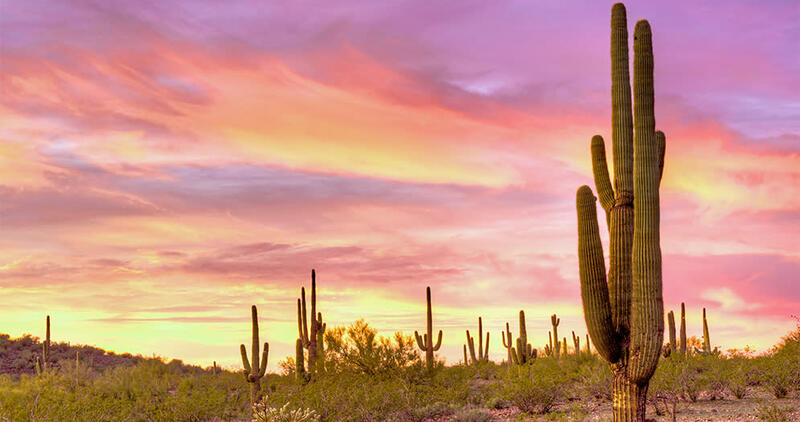 With more than 400 miles of trails winding through 30,200 acres of pristine desert, Scottsdale’s McDowell Sonoran Preserve is a prime spot for outdoor enthusiasts. Make sure you’re close to the trailhead as the sun starts to dip below the horizon – then pause and wait for the show. You’ll be rewarded with the vibrant glow of backlit cholla, dramatic shadows cast by large saguaro cacti and flushes of rich desert colors like nothing you’ve seen before. For one of the most romantic sunsets in the city, reserve a patio table at J&G Steakhouse. As you dine on award-winning cuisine inspired by Chef Jean-Georges Vongerichten, you’ll have an unparalleled view as the sunset bathes the surrounding mountains in rich hues of crimson and purple, and the city lights twinkle below. 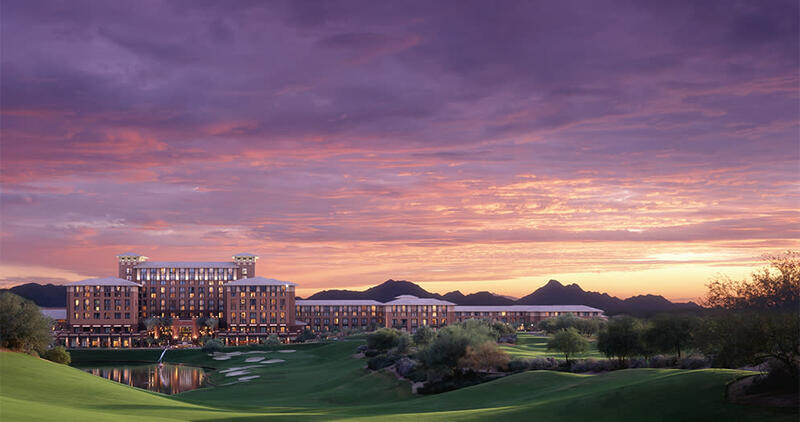 Scottish bagpipes signal the end of the day at The Westin Kierland Resort & Spa. Professional bagpiper Michael McClanathan calls in golfers off the course at sunset with his melodic Old World Scotland tunes. Even if you’re not golfing, you can still kick back with frosty margarita at the Dreamweaver Canyon fire pit and watch as the sun casts its last rays of the day. This chic lounge on the 14th floor of the Talking Stick Resort & Spa boasts unparalleled views of Camelback Mountain and the surrounding Salt River Pima-Maricopa Indian Community. Besides jaw-dropping views, Degree 270 also is known for its live entertainment, dance floor, and regular drink specials. It’s not your traditional “sunset spot,” but definitely worth a visit! 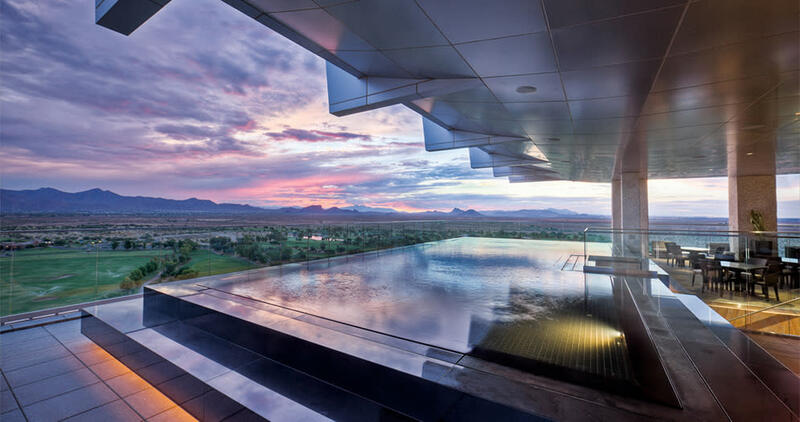 The top of the tower at the Hotel Valley Ho marks the spot for one of the best views in Scottsdale. 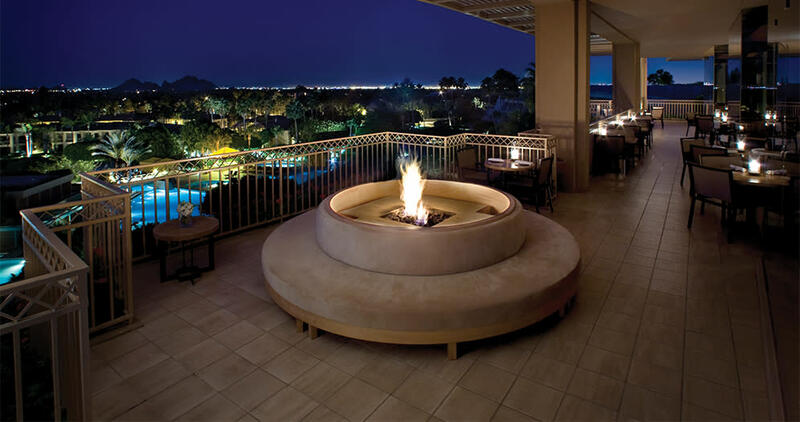 From this vantage point, you’ll overlook Camelback Mountain and the sparkling city lights. After sunset, head down to the retro-chic ZuZu for dinner and cocktails.